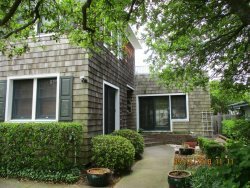 108 49th Street, Atlantic, Virginia Beach, North End, vacation rental, Pacific Avenue, Beach, Oceanfront, Resort property, weekly rental, summer rental, Neptune Festival, Shamrock Marathon, Accommodations, Lodging, Tidewater, This home is much larger that it looks!!! 5 Bedrooms, 3 Full Baths, 2 Half Baths. Sleeps 9-10 people. 2 Large Living Areas, Nice Outdoor Patio with Outdoor Shower, Gas Grill and just a short walk to the beach! Oceanside of Atlantic Ave. Spacious & Comfortable Oceanside Home that Sleeps 10! Just Steps to the BEACH!